Accessory dwelling units (ADUs) are becoming more and more popular with Portland-area homeowners. Improvement Remodeling handles every aspect of accessory dwelling unit construction: design, construction, plumbing, electricity, cabinetry, appliances, flooring, carpets, built-ins, shelving units, and paint. Our expert contractors have years of experience with ADUs and can help you with any stage of the construction process. Accessory dwelling units, or ADUs, are additional stand-alone living spaces (commonly referred to as mother-in-law apartments) built on your existing property. ADUs traditionally feature their own entrances, kitchens, baths and bedrooms. ADUs can be garage, attic or basement conversions, or new detached units. Improvement Remodeling has built many ADUs in the Belmont and Hawthorne areas of Portland. Over the years, Oregon has modified its zoning codes to encourage ADUs in more residential neighborhoods throughout the state. 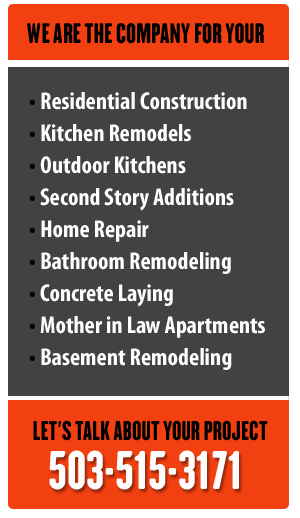 Contact Improvement Remodeling today to find out if your Portland-area home qualifies for an accessory dwelling unit.